2018 Civic Type R shown in Championship White. 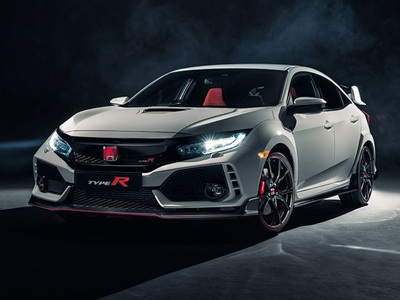 If you love the feeling of pure control and responsiveness, nothing can match the staggering performance of the Type R, available for the first time on U.S. soil. With a balance of design and power, even a short drive brings you closer to the road than you’ve ever felt before. The most aggressive, most powerful Civic ever built is at home on any track and ready for every challenge. Every angle of the aerodynamic body was designed to enhance downforce and keep all four tires stuck securely to the asphalt. Underneath the aggressive, track-tested exterior is a totally new suspension design for sure-footed handling in the corners and high stability at speed. 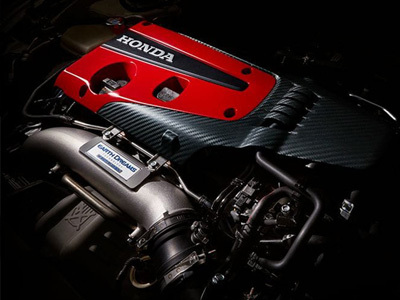 Wrapped in iconic red cowling, the 2.0-liter VTEC® Turbocharged Engine is 70 years of Honda engineering for the track distilled into one Civic — the Type R.
A low, track-ready stance is enhanced by widened fenders and an aerodynamic body that provides the perfect balance of downforce and minimal drag. A red-infused, racing-inspired interior is built to connect you to the road and electrify your senses from the inside out. Three customized Drive Modes, including the track-ready +R Mode, and a Digital Display with five screens give you a true performance-based experience behind the wheel. 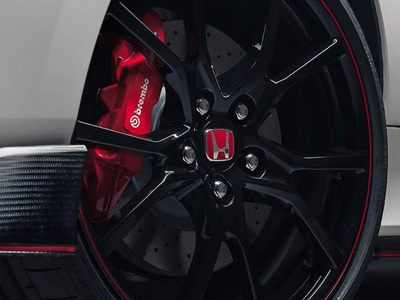 20-inch Gloss Black Alloy Wheels are shod in performance tires exclusive to the Civic Type R and showcase the track-ready 4-piston Brembo® front brake calipers. Red and black suede-effect sport seats are constructed with aggressive side bolsters that assist the driver in maintaining complete control during the most extreme events. 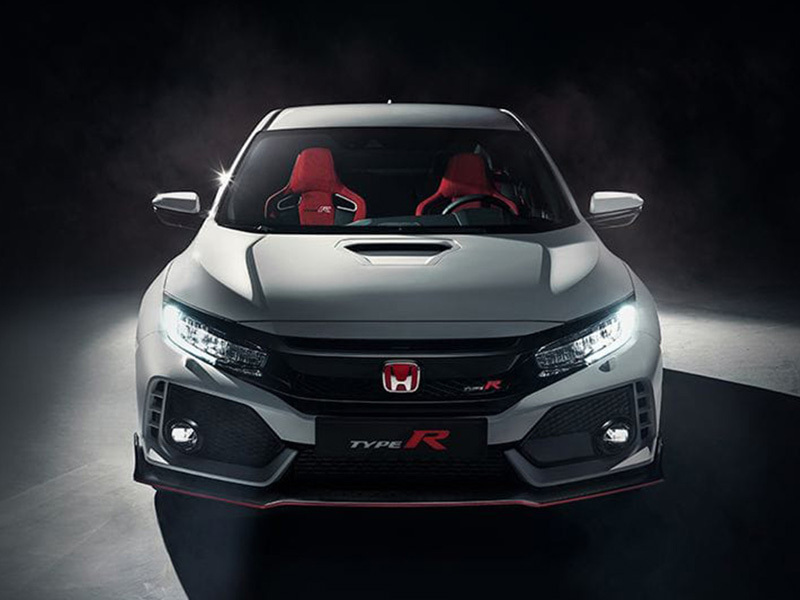 Even with its race-bred at tributes, Type R is designed to be enjoyed every day and everywhere by racers and enthusiasts alike. Rev-Match Control eliminates the need for throttle input while braking and downshifting. A lightweight, single-mass flywheel and helical limited-slip differential help the engine rev without delay and accelerate through corners without excessive wheelspin. An optimal blend of low-speed response and high-speed stability is enabled by a dual-pinion system, creating a direct connection between driver and tarmac. There’s a whole world of enthusiasts who share your aspirations of owning a Type R. Keep up with their adventures by following OfficialHonda on Snapchat, checking out our Twitter and subscribing to Honda on YouTube. 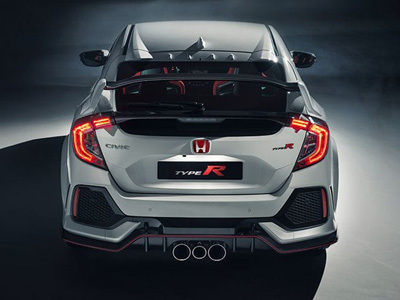 22 city/28 highway/25 combined mpg rating for Civic Type R with 6-speed manual transmission. Based on 2018 EPA mileage ratings. Use for comparison purposes only. Your mileage will vary depending on how you drive and maintain your vehicle, driving conditions and other factors.